In April 1985, John Ruth transcribed and commented on several notes from a journal of Henry R. Bergey (1843-1925). The article is rich in the color of life as it used to be among local Mennonites, and we’re happy to share it with you again. Photocopies of the journal are archived at the Heritage Center. …There is difficulty, even with written records, in getting at the “feel” of life, the subjectivity of a spiritual family in a bygone era. Mennonites in the Delaware Valley, long suspicious of education, left only a small deposit of reflection in written form, by which we can re-enter their thought world. So it’s helpful to page through the manuscript books of Henry Ruth Bergey (1843-1925), farmer in “Bergey Valley” along the Indian Creek in Franconia Township. This grandson of long-time Preacher John Bergey (1759-1841), father of Deacon Vincent K. Bergey, and grandfather of Bishop Curtis L. Bergey, recorded quite a few thoughts, as an old man, in a dozen or so miscellaneous notebooks. Recently Curtis Bergey lent me the one in his possession, written before and after Henry Bergey’s eightieth birthday in 1923; I find it valuable enough to share samples of it with readers of the MHEP Newsletter. Since this 150-page handwritten booklet begins with a little explanation, I’ve included this as the first sample. Some readers may find the spelling so rough and phonetic as to cast doubt on the booklet’s value. Personally, I find it revealing in helpful ways, historically. Having grown up in neighboring Lower Salford, I recognize the particular accents of Franconia which I heard from Franconia preachers as a boy. Among them are the difficulty in keeping “d” and “t” distinct; the tendency to pronounce “or” as “are”; and the inability to say “z” on demand (you will notice that Henry spells “cleanse” as “clence”). Of course we in Lower Salford, or you at Deep Run or Swamp or Bally, for that matter, had just as much trouble with “v” and “w” as anybody in Franconia. I don’t think we were as quick as Franconia, though, to use the “th” sound where it didn’t belong. This clip of Henry Bergey’s grandson Curtis speaking from the pulpit at Franconia gives a sense of the local Pennsylvania Dutch accent. It also conveys the traditional spiritual and biblical tone present in Henry’s journal. More important is the way this booklet demonstrates Henry’s easy access to the scriptures, from Genesis to Revelation, which he cites easily on any subject he gets onto. We know they are coming from his memory, because he spells them phonetically rather than copying them. Even though his personal idiom is all “Dutch”, he prefers to write in English he can only partly handle. He’s in the same predicament that caused Bishop Jonas Mininger to say, while attempting to preach in English at a Salford baptism, how pleased he was to see the twenty “convicts” ready for church membership. Henry is clearly looking toward the future, wishing to convey his set of values to a posterity that will be English-speaking. But his values are very traditional Mennonite ones. They integrate salvation and ethics in a seamless web. 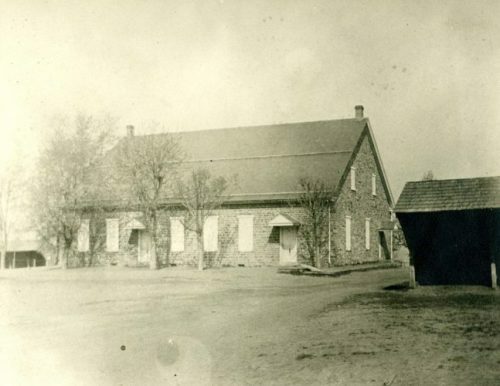 Hospitality, honesty, obedience, consistency, humility: these are the hallmarks of Henry’s old Mennonite value-system. He picks up his stories from conversation, visiting ministers, and religious papers. His own congregation may have no mission outreach, but he himself talks to a missionary, and rebukes people who do not make the way of salvation clear to others. He accepts Luther’s teaching on grace, but insists, as his Anabaptist forebears had done since Luther’s time, on good works to provide evidence that grace has been received. He accepts regeneration, but cannot recognize it in persons who display hatred. He casts a quizzical glance at people who announce that they have been “converded”, but still have an ostentatious appearance. An index at the end of Henry’s little volume lists no less than 41 little scriptural homilies and stories. I find the latter enjoyable and revealing, in their elliptical way, of the Franconia ethos, and I have included several short ones in the following selection. I value even more, historically, the reflection that the longer homilies seem to be giving of the older Mennonite way of using Scripture. In the incessant quoting and interweaving of passages from all parts of the Bible, I suspect we are hearing how Bishops Josiah and Abraham G. Clemmer preached at Franconia for the three-quarters of a century following the Civil War. These sermons, being preached in German, would have added to the content we are sampling here a greater eloquence, since they are in the user’s Muttersprach [mother tongue]. 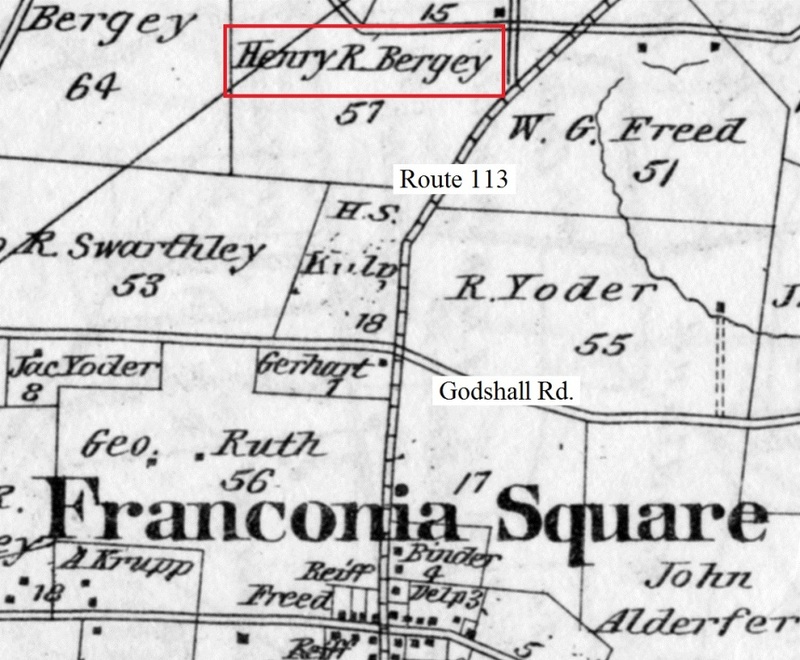 Location of Henry Bergey’s farm along Telford Pike and Bergey Road between Souderton and Franconia. We find in the good Book that we are adwised to Serch the good book are the Scripture we might think that we have Everlasting life in them and they are they which Testify of you: So it came to my Mind to Copy some of the Importend Stories and Set them cloth together So that Each one can soon find what is required of Each one: when we would Expect onct to Enter into that Butyfull City. …To read the whole Bible and good adwises Should no man neglect. no mather of whome it were given. Jesus himself Said that a Prophet is not without hunner Save in his own house: Therefore it is necessary to Serch the Scripture Espesial thoes who can not enjoy themself in reading Bible Stories. Therefore the writer will coppy Some Small Stories they might find Some Stories to there tast: we find the feare of the Lord is the Beginning of wisdom. wisdom is a defence. Hear you will find a Story which was told to me By Reveren Daniel G. Lapp. a missionary from India: of a minister who lived onct in Illanoise and Preached there For Several years: and it hapened that Some of his nearest Friends moved to the Far west, where they often wrote to that minister to come to them as they need a minister there: at last the minister mat his mind up to Follow them, and that minister Preached there for Twenty years: and often came in his mind to come Back to Illanoise onct to wised his Old Friend and Brethren in Faith: the minister wrote a letter to one of his Best Friend and also a Brother in Faith mearly to Find whether they are alive yet. Before he would go on his Journey Back to Illanoise. And did not mention a word that he Expect to wised them Shortly: Thoes Good Friend answered that letter Promptly. and wrote a wery intresting letter to that minister in Reply on his leter: But thoes good Friend werlack of that one thing which we find Phillipen 4:5 let your modration Be knowen to all man: when thoes good Friends would have obayed that, they would Shury not have Bin caught in that Trap: that thay must Shame themselves later. that minster cmae on a wised to thoes Best Friends in Illanoise unExpeced and he wer not taken up as a loving Friend. non of them know him any more he Did not look like a tramp Neither came he like an update man. he walked From the Station and met his Best Friend in the afternoon in Front of there house and asked the woman For lodging. But the woman Said in reply. they are not Prepared for Strangers to lodge But the minister wer not Skared. when Even his lodging were refuse. he knoweth when they would know him they would also do as Jesus told that Sameritan woman if you would know me you would Pray me for that Everlasting water So would that woman have Don if She would know him. in Stead to go to inquire her husband what he got to Say. they Both Stand under the Forhead of there Born. and looked after the Stranger. who took his Seat on the Porch: mearly to hear what the husband got to Say. and Boath came to the hous. and the husband Said they are realy not Prepared For Strangers to lodge. But the Stranger were not Scared when even the Second time wer refused: then the Stranger Said in reply, he is tired of his Journy and he daunt want to go any Further he would like to Stay with you: at last it came a little heavy on the old man and he Said we must try to Sahpe it he can Stay. with them. he knoweth that he hath not told the trouth. they have a large house. and Said they are not Prepared to lodge one Person: and the minister kept his Sead on the Porch till the Super was Prepared then the woman came out and Said to the Strainge the Super is now Prepared. and if he wants Something to Eate he can come in: the Strange went in and tock a Seat at the table. and wery little wer Spoken. at the Table and when they wer Filed the Stranger Starded for his Sead on the Porch again then the husband Said you can take a Sead in hear and they Stard a Conversation with Each other: while the woman washing Dishes In another room. then the husband ask the Stranger about his Buisness Then the Strange Said it was long agoe in his mind to come Back to Illanoise Onct more to wised my Old Friends and Brethren in Faith But it would never fid till now. then the minister gave his name and said I am the minister who Preached in your meetinghouse Several years: and the husband was nearly Staunded, and he ran to the Door at the other Kitchen where his wife was washing Dishes and Said what a great Shame have we Broad upon ourselves. this is the minister to whome you wrote that lether. the other week. and the woman ran in and Shaked hands with the minister and wept. and Said O i Shame myself that I do not know where to look at: then the minister Said you need not to Shame of me I mearly want to See how you would Deal with Strangers: then the woman Said this Should be a worning that I never Deal with Strangers as tramps. we find that Some People could not Believe that an upright man would Fool his Best Friends in such a way: the writer could not Prove that Because Such things may hapen to Prove themselves. what did Peter Says when they all Deny ore For Sook thee will I not: what Did he: and also why did Jesus not told that two man who went over the Field that he is Jesus who is risen from the Dead. I Read onct a Storie of Dr Marten Luther that when he Slept onct in his room: then the Devil came in and wrode all the Sins that he had Don in his Life on the wall in his room: and when Luther wakened from his Sleep: then Saith the Devil, how do you Expect to Eskape all these Sinns. then Luther looked after thoes Sinns: and Said in reply to the Devil. the Blood of Jesus Christ is able to clence me. From all my Sines: Now when our faith is Strong Enuf to Believe that the Blood of Jesus Christ will clence us from all our Sins. then we have a good anchor: But we Should never forget that Faith without work is Dead and also a tree is knowen By his Fruit. and also it Said a good tree cannot Bring corrupt Fruit. Therefore let us Prove Ourselves we can Be fooled with the Foolish Virgins when we trust to much on that Promise without to Obay his word. I Read onct a Story of a Person who Clames that Each once could know whether he is Newly Born are not. he Said Spiritual minded Gives Evidence that he is newly Born. But what have you to Say of James…and [what] you Find [in] Luke 9:54? Do you call Spiritual mind when Even lodging were refused they were ready to Burn thoes Sameritans Even as Elias Did. I call that Fleshly minded: and we find Jesus Desipels were Sometimes week People Same as we are. Hear you find a Story of a Son who lieth at the Poind of his Death: he caleth his Father and Said. Father I am at the Poind at my death. and I know that I am lost when I Die. Bury me at the Side at the Street which leadeth to the Pasture of your horses. and when you Path three times a Day Forget not and Remember that hear lieth your Poor Son who never gets any good adwise and never herd a Prayer out your mouth and never herd anything about my Salvation. Hear you will Find a Storie of a woman who clames to be newly Born again. She met with a minister who came From the west, and she Shaked hand with the minister and Said do you know me yet: the minister looked at the woman and Said no, and I daunt Believe that I Ever Saw you Before. the woman came in Stile and Said to the minister Yes you Saw me Before Ten years agoe when you were hear you converded me: the minister looked after the woman and Said you looked Prety much as it is of my work. People born of man looking after the Spirit: the Scripture teach us that a tree is Knowen By his Fruit. Wise virgins depicted on the portal of Bern Munster, Bern, Switzerland. Photo by Forrest Moyer. Very interesting. I was better able to understand the writing by using my Grandfather’s PA Dutch accent in my head as I read. Proud to be part of the legacy of Franconia Mennonite Church and these faithful believers.